Ask US economist Warren Mosler whether the national disability insurance scheme should be paid for by a new levy or by spending cuts, and you’ll get a jarring answer – neither. He’ll also tell you the question shows both the government and the opposition don’t really understand how public services are funded in a modern economy. What’s really needed, Mosler adds, is both a simultaneous cut in taxes and an increase in spending to cover NDIS costs. That will restore what ought to be an essential fixture of Australian, and world, economies: good, healthy, productivity-enhancing deficits. Whilst I have a few differences with the article, it is nice to see Modern Monetary Theory (MMT) get some time in MSM in Australia. I will say Centre of Full Employment and Equity (CofFEE) agrees with Warren Mosler as it was founded by his colleague Bill Mitchell, also a creator of Modern Monetary Theory. Together with L. Randall Wray, they make up the big three of MMT. In my own small way I advocate MMT, there are those three and then they are the ones with the great PR skills who are Stephanie Kelton and Mike Norman. I do not always agree with the way the message is sold but I do agree with the message. MMT economists are a small but growing group. As was discussed in the two previous posts, there is no financial need for these governments to borrow at all in order to fund their deficit spending. The government has no need of funding. It is in a position to create and destroy its own money as it pleases. Whenever it transacts with the private sector – a ‘vertical’ transaction – money is either created or destroyed. Whenever the government runs a budget deficit or surplus, there is a net change in private-sector holdings of financial assets. In contrast, when private sector agents transact among themselves – a ‘horizontal’ transaction – there is no net change in financial assets, because such transactions always create a private asset and a matching private liability, netting to zero. 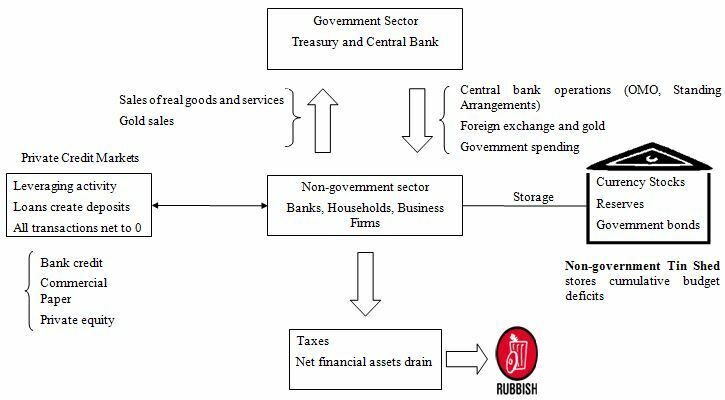 The government can create or destroy net private financial assets at will; the private sector cannot. The horizontal and vertical transactions are best illustrated by the following diagram. So when reporters are asking where money is coming from to fund programs offered by political parties they are severely misguided. There are only two options to pay for them. Raise taxes or cut costs. Both carry risks. This is a common mistaken refrain in wondering where the money is coming from as shown in the first 9 seconds of this video and highlighted in this article and some other more recent announcements. Now Uhlmann is not wrong in saying the options he provide carry risks, he goes on to state the specific risks but for the private sector people on the end of either those option both are the equivalent of a tax hike. That is not to say cutting costs is without its merit if it cuts cost on what is considered wasteful spending. What is wasteful spending? Well that’s a political decision. Previously the Government has said some Defence expenditure is and currently the Coalition says the Schoolkids bonus is. There is a third option called deficit expenditure and it carries a risk too. That risk is high inflation. So “Where is the Money Coming From?” is a really naive question. 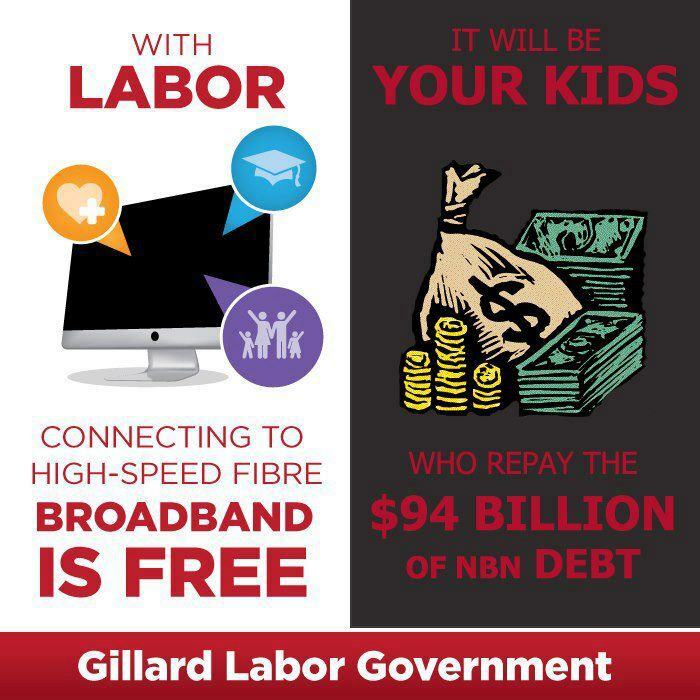 The Coalition has announced their broadband plan for the 2013 election and have a nice little infographic to go with it. Unfortunately for them I don’t think it is selling the message they wish it to do. I am sure many would dispute the price tag as well. Nonetheless that message is what we shall discuss. Some critics of fiscal policy claim that by running large budget deficits, governments risk creating unsustainable levels of public debt and a burden on future generations. In reality, budget deficits create no such debt burden for societies whose governments are monopoly issuers of flexible exchange-rate fiat currencies. The debt of these governments will never become unsustainable unless for some inexplicable reason they decide to borrow foreign currency rather than their own fiat money. In fact, as was discussed in the previous post, there is no financial need for these governments to borrow at all in order to fund their deficit spending. The reason, in practice, that they do issue debt to match their deficit spending is to meet voluntarily imposed legislative requirements that are in place for operational or political reasons – none of which are indispensable – but not financial reasons. This clearly shows the impracticality of leaving any debt to your children or your grandchildren. I am not saying the Coalition is economically illiterate, they are not, just misguided. Not all governments are so fortunate. The Spanish and Greek governments, for instance, don’t have the same policy freedom because they have committed themselves to operating under a common currency, relinquishing the right to issue their own currencies as they see fit. National governments who maintain a fixed or pegged exchange rate similarly give up some policy freedom. Lower levels of government, such as local or state governments, also lack such freedom because they are mere users of the currency, as opposed to issuers of it. However, for the governments of the U.S., U.K., Japan and many other countries, there is plenty of scope to pursue as much deficit spending as is necessary to facilitate economic recovery. None of this is to suggest that debt is without consequences. But the debt that is problematic is private debt, not public debt. Unlike the government, private households and firms really do need to fund their spending. A household can’t simply credit its bank account on whim; nor can a private firm. When private debt can’t be paid, economic crises can occur, as recent events have made clear. Australian Modern Monetary Theorist Bill Mitchell has explained in an eye-opening post how the private-sector desire for bonds was made very evident in his country in the early 2000s during the period of a conservative government that oversaw ten budget surpluses in eleven years. 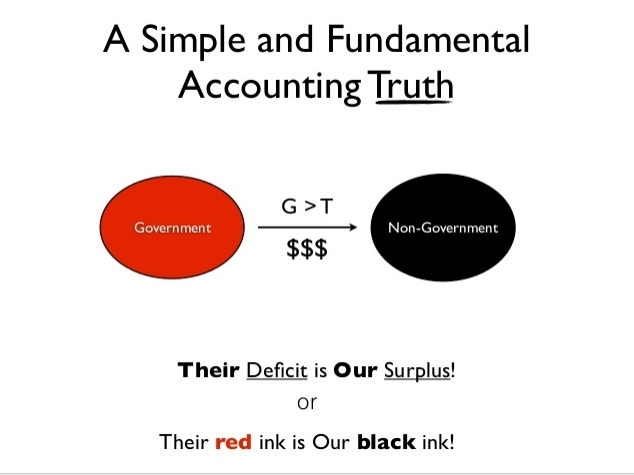 Since the budget was in surplus, it was initially supposed that there was less need to issue government debt – the assumption being that the purpose of debt is to fund budget deficits. The assumption was quickly revealed to be unfounded. The drying up of government debt caused disquiet in the financial community, which suddenly had less access to risk-free government bonds. The government’s response was for the central bank to sell bonds (issue debt) even though there was no budget deficit. This should have demonstrated to orthodox economists once and for all that the issuance of public debt has nothing to do with funding government net spending. In short, the government has no need of funding. It is in a position to create and destroy its own money as it pleases. Whenever it transacts with the private sector – a ‘vertical’ transaction – money is either created or destroyed. Whenever the government runs a budget deficit or surplus, there is a net change in private-sector holdings of financial assets. In contrast, when private sector agents transact among themselves – a ‘horizontal’ transaction – there is no net change in financial assets, because such transactions always create a private asset and a matching private liability, netting to zero. The government can create or destroy net private financial assets at will; the private sector cannot. Private-sector agents are financially constrained; the government is not. This is an extract from Heteconomist on the Social Significance of Money. 1. Dollars are created when government (and their central banks) spend. Contrary to popular belief, governments DO NOT NEED to collect taxes or to borrow before they spend. They can simply create dollars from thin air. 2. Too much of the latter sort of “money creation” leads to excess inflation, and too little leads to households not having what they regard as enough money. So spending declines and unemployment rises. 3. It follows that attempting to balance the budget or avoid deficits or anything of that sort is a TOTAL AND COMPLETE waste of time. It’s pointless. If unemployment is excessive, government needs to create money and spend it (and/or cut taxes). Conversely, if inflation is excessive, government needs to do the opposite: that is, withdraw money from the private sector via a budget surplus, and “unprint” the relevant money. Fiscal Responsibility – What is it? A quick and easy counter-point to Daily Telegraph’s Jess Irvine Column today.